Believe it or not, I'm not tired of brownies yet. I guess I'm more of a chocoholic than I thought. 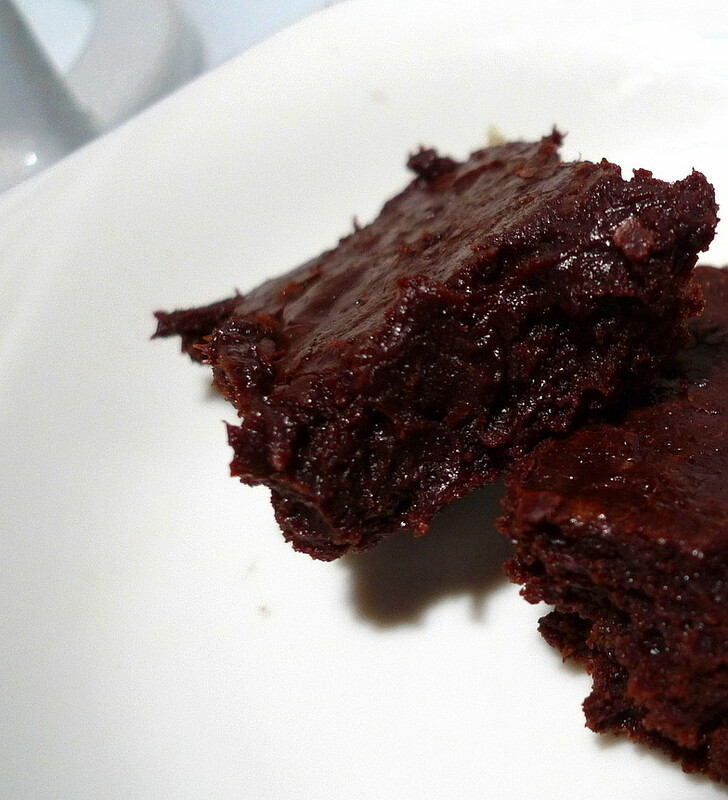 Either way, I know that I could never get tired of eating these brownies from Maida Heatter. The recipe calls for two types of chocolate - unsweetened and semisweet (though I used 70% bittersweet for extra chocolatiness). It also uses very little flour, just enough to hold everything together. With a recipe like that, you know you're in for some major gooeyness. And OMG, these did NOT disappoint in that aspect at all. In terms of gooey fudginess, these were off the charts. I don't mean that they were so gooey as to be oozing out once you cut them. They definitely hold their shape. 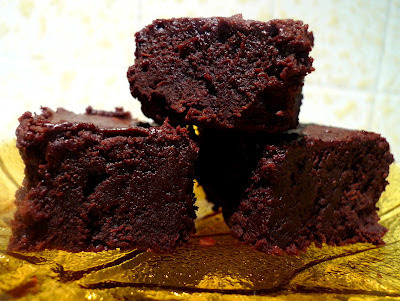 But, when you take a bite, all that luscious, rich, soft chocolate brownie just spreads and flows over your tastebuds. It's like chocolate velvet. And tastewise? 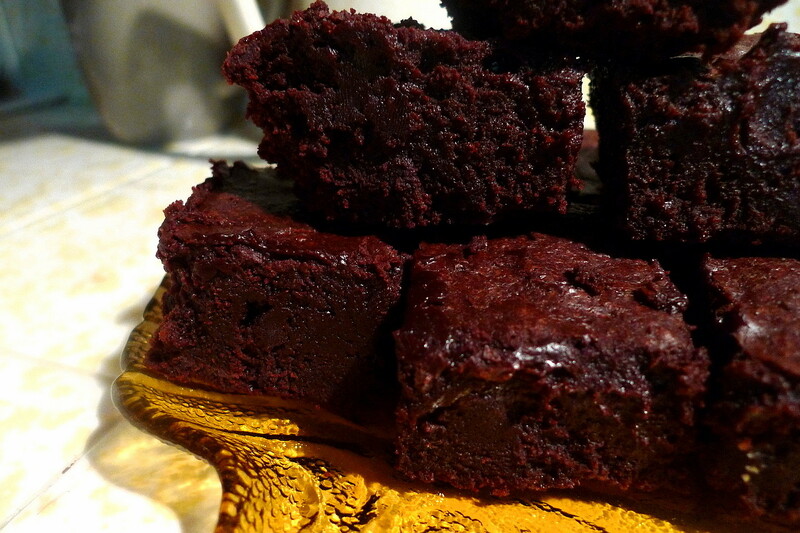 These are deep and dark, a grown- up type of brownie. I highly recommend using a good dark chocolate for these. Note, "good" does not mean expensive, but Nestle Tollhouse chocolate chips aren't going to cut it either. Trust me, this is the time to treat yourself. All in all, these brownies were a heavenly experience, the likes of which I have never before known but will crave again and again. If you make them, you will too. 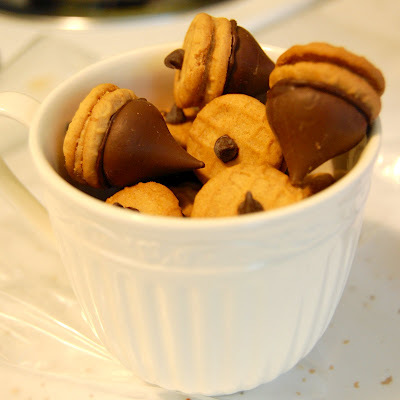 Combine the chocolates and butter in a double boiler and melt, stirring well until completely melted and smooth. Remove from heat. Whisk the sugar with the eggs. Add the salt and vanilla. Whisk in the chocolate butter mixture until completely incorporated. Fold the flour in with a rubber spatula. Pour into a foil-lined 8x8 pan and bake at 350F for 30 min. 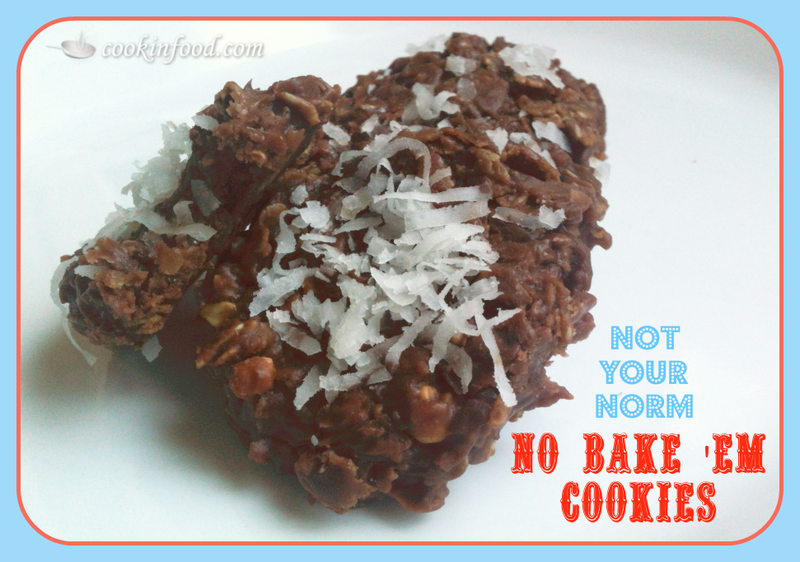 Chocolate, coconut, AND peanut butter - oh my! 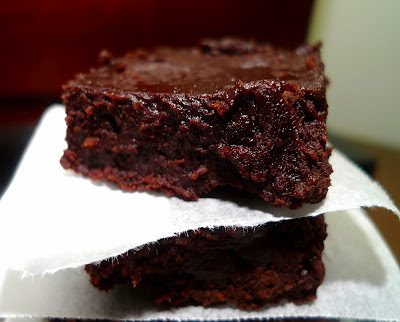 I first found out about these brownies from Smitten Kitchen. Believe it or not, this was also one of my very first posts on my blog. Of course, back then, I didn't have a good camera and didn't know anything about food photography whatsoever, so the picture was awful. The brownies, however, were awesome, so into the brownie lineup they went. Let me just say that you can never go wrong with Alice Medrich. 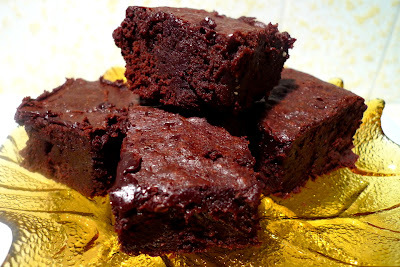 I've heard people rave about her cookie recipes and these brownies are no exception. True, they won't give you that crackly papery thin crust on top. But, they are stain your fingers fudgy. And boy oh boy are they rich. 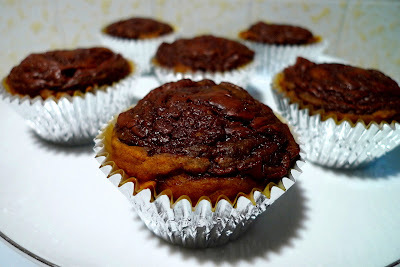 I only used natural cocoa powder instead of Dutch (you can use either) and was plenty pleased with the chocolate punch that these had. So, whip up a batch of these brownies, grab a bowl of vanilla ice cream to go with it (you're gonna need it), and indulge in a chocolate dream come true. 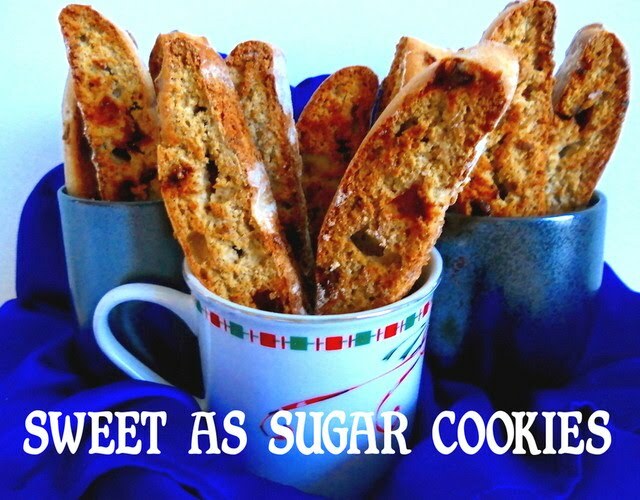 Combine the butter, sugar, cocoa, and salt in a double boiler or in a bowl set over a pot of barely simmering water. Stir occasionally until the butter is melted and the mixture is smooth and hot enough that you want to remove your finger fairly quickly after dipping it in to test. Take your butter chocolate mixture off the heat and set aside briefly until the mixture is only warm, not hot. Stir in the vanilla with a wooden spoon. Add the eggs one at a time, stirring vigorously after each one. 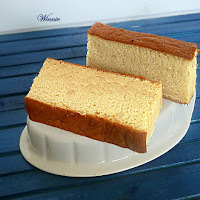 When the batter looks thick, shiny, and well blended, add the flour and stir until you cannot see it any longer, then beat vigorously for 40 strokes with the wooden spoon. 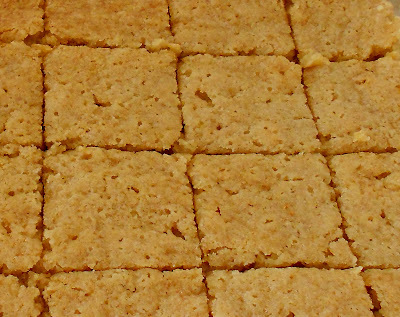 Spread evenly in an 8x8 pan lined with foil or parchment paper. Bake at 325 for 25 min. (mine took a little longer) until a toothpick stuck in the center emerges slightly moist with batter. Let cool completely on a rack. You can always count on King Arthur Flour to provide you with a good recipe. 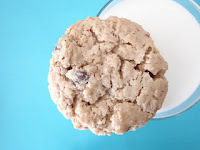 In fact, last summer, when I did my search for the best chocolate chip cookie, the King Arthur Flour CCC was one of the top finalists. So, you can bet that I had to try their brownie recipe. With regards to the ingredients, I did omit the espresso powder since I don't drink coffee. 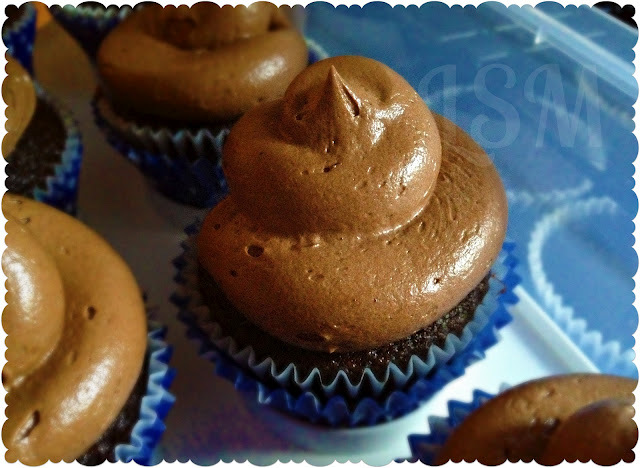 I also used natural cocoa powder instead of dutch-process as the recipe states. Whether that would make a difference in the flavor of the brownies or not, well, I'd find out. 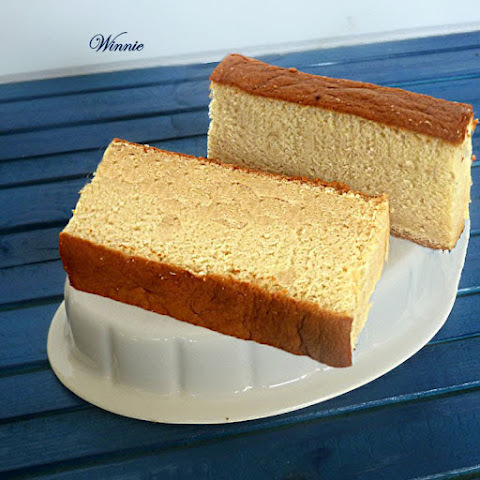 The recipe says that you should combine the eggs with the cocoa powder and that you should heat the butter and sugar together until the sugar dissolves. 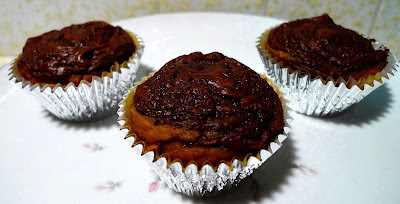 But, reading the reviews for this recipe, a lot of people said that the egg-cocoa mixture was difficult to work with and that they also had trouble getting the sugar to dissolve. The way I figure it, changing the method isn't going to change the taste of the brownies, and that's really all I care about. So, I took a couple liberties with the recipe. I melted the butter and added the sugar but didn't worry about getting it to dissolve. Then, I added the cocoa powder to the butter-sugar mixture, then the eggs, and so on. 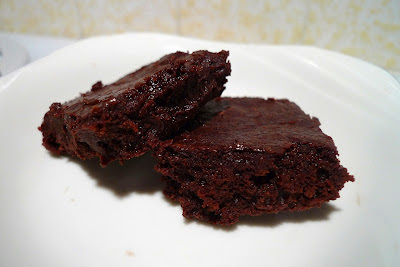 I was a little worried that these brownies would come out cakey due to the fact that they had more flour than other brownie recipes I've tried and they also used baking powder. But, true to their name, these brownies were super fudgy, which is just how I wanted them to be. 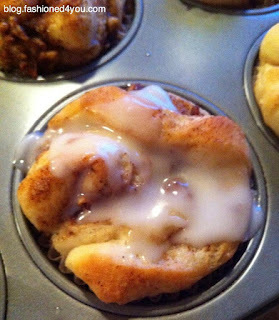 I may have underbaked mine just a little because they were also really gooey. But, is that a bad thing? Of course not! It makes them like molten chocolate cakes. Fudgy, gooey, and delicious. Could you ask for anything more? Preheat oven to 350F. Lightly grease an 8x8 pan. Crack the eggs into a bowl, and beat them with the cocoa, salt, baking powder, espresso powder (if using), and vanilla till smooth. Melt the butter in a saucepan set over low heat, then add the sugar and stir to combine. Continue to heat briefly, just until the mixture is hot, but not bubbling; it'll become shiny looking as you stir it. Heating the mixture to this point will dissolve more of the sugar, which will yield a shiny top crust on your brownies. Add the hot butter/sugar mixture to the egg/cocoa mixture, stirring until smooth. Add the flour and stir until smooth. Spoon the batter into the pan. Bake for about 30 min., until a cake tester inserted into the center comes out clean, or with just a few moist crumbs clinging to it. The brownies should feel set on the edges, and the center should look very moist, but not uncooked. Remove them from the oven and cool on a rack before cutting and serving. Considering that Alton Brown is THE man when it comes to recipes, I just had to put his recipe for Cocoa Brownies into the lineup. I have to admit that I didn't totally follow his method for making them. Instead of adding the sugars to the eggs, I added them to the butter. Then, I mixed in the cocoa powder (which takes care of any lumps without having to sift it first), and then I added in the beaten eggs and so on. I'm not saying that using my method versus his will make them turn out any better; it's just how I like to do things. The brownies took 1 hour to bake in my oven and they were still just a little gooey in the middle (which is perfection in my opinion). They did puff up a little high in the oven and I worried that they would end up cakey, even though I made sure not to overbake them. But, I needn't have worried. As they cooled, the brownies flattened down nicely and turned into a dense slab of pure chocolatey fudgy insanity. Holy smokes! These brownies are rich! They are not for the faint of heart. No, these are for the hard-core chocoholics. The intense fudginess factor just blew my mind. 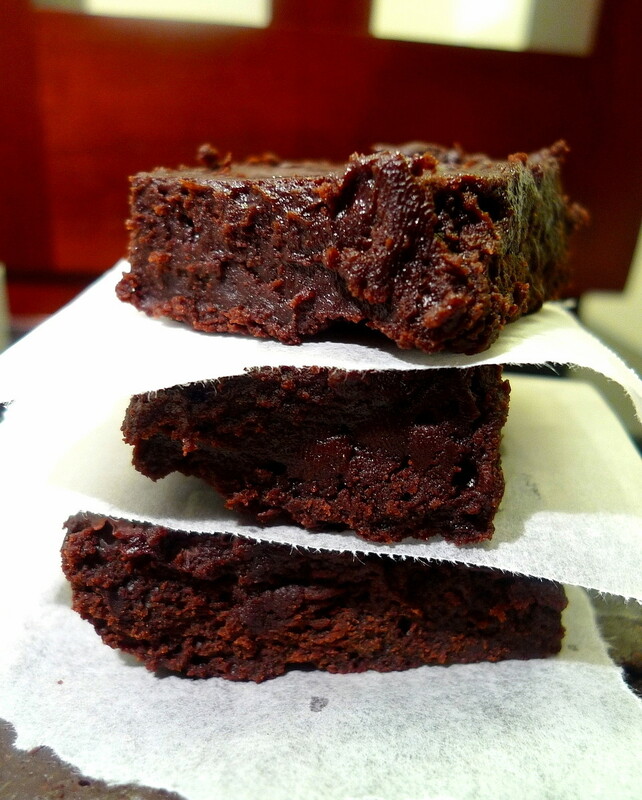 Having eaten boxed mix brownies for most of my life, I had no idea that brownies could even be like this. And to think, they turn out this way without having to add any melted chocolate to the batter - just cocoa powder. All I can say is wow! Alton Brown, you really are THE man! Preheat oven to 300F. Butter and flour an 8-inch square pan (I lined mine with foil). In a mixer fitted with a whisk attachment, beat the eggs at medium speed until fluffy and light yellow (I just whisked mine by hand till they were combined pretty well). Add both sugars. 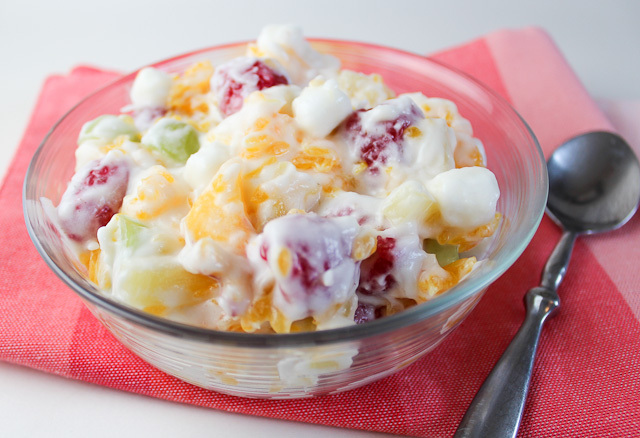 Add remaining ingredients, and mix to combine. 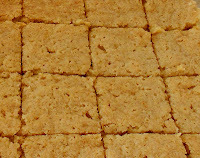 Pour the batter into a greased and floured (or lined) 8" square pan and bake for 45 min. (mine took 1 hour). Check for doneness with the tried and true toothpick method: a toothpick inserted into the center of the pan should come out clean (I took mine out of the oven while they were still slightly gooey in the center). When done, remove to a rack to cool. Resist the temptation to cut into it until it's mostly cool (this is crucial - you want the brownies to cool some so they become all dense and fudgy). I didn't sift any of my ingredients. I whisked my eggs by hand just till they were well combined. I melted the butter, then added the sugars and vanilla. Then, the cocoa powder and salt (which takes care of the lumps without sifting). Then, I added the eggs and finally folded in the flour just till combined. What can I say? It was time for another great recipe quest. And what better than a quest for the best brownie ever. 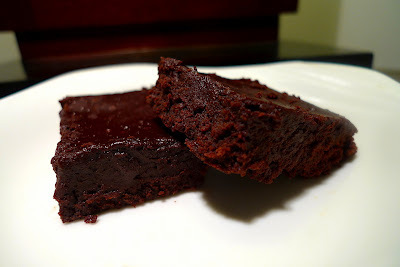 So, I decided that I would now kick off "The Best Brownie Bakeoff." Yeah, I like alliteration as much as I like brownies. 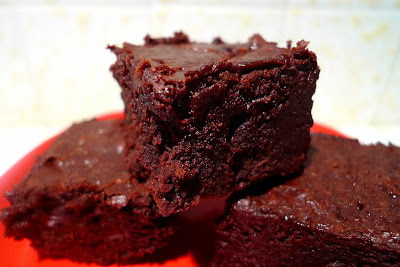 For me, a brownie has to be fudgy and chewy. In my opinion, if it's cakey, then that makes it a chocolate cake, and not a brownie. 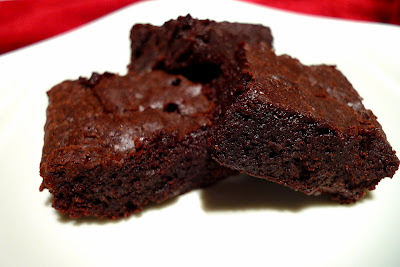 Secondly, brownies have to have a good chocolate flavor to them, and the more the better. I'm not a chocoholic by any means, but when it comes to brownies, I say go big or go home. 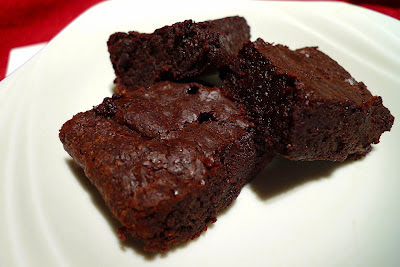 So, I've compiled a collection of what I feel are the best brownie recipes out there. You've probably heard of some of them, and there may be a few new ones. I've broken them up into three groups based on the ingredients in them. I'm curious to find out which combination will yield the ideal brownie. Can cocoa powder alone really do the trick or is melted chocolate absolutely necessary for awesome gooey-ness? Who knows, the results may surprise you. I also promise to keep these brownies as cost-effective as possible. Of course, if you just happen to have Valrhona or Scharffen Berger or any of that really good stuff in your kitchen, feel free to use it. But, for me, it's gonna be Hershey's cocoa powder and Trader Joe's chocolate (72% pound plus Belgian - only $4.99) all the way. At the end of this quest, I may not ever want to see another brownie again (or at least for a month), but I'm willing to make the sacrifice in the name of science. So, let the brownie baking begin! 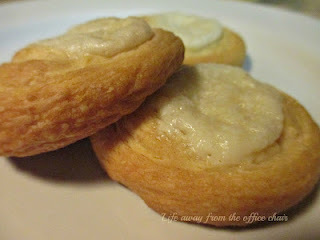 For this month's Secret Recipe Club, I was assigned to Holly's blog, Phemomenon. In case you didn't know, she has some of the cutest kids ever. Lucky them, because they get to eat all of her scrumptious creations. 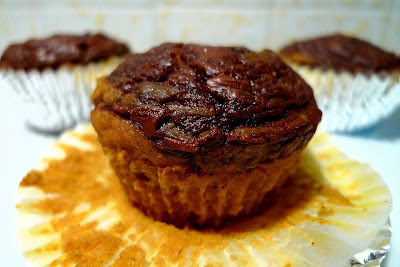 After searching through a ton of recipes on her blog, I finally decided to make her Self-Frosting Pumpkin Nutella Muffins. 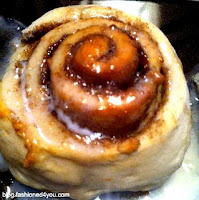 After all, I love, love, love pumpkin and it just so happened that I had some Nutella sitting in my pantry too. 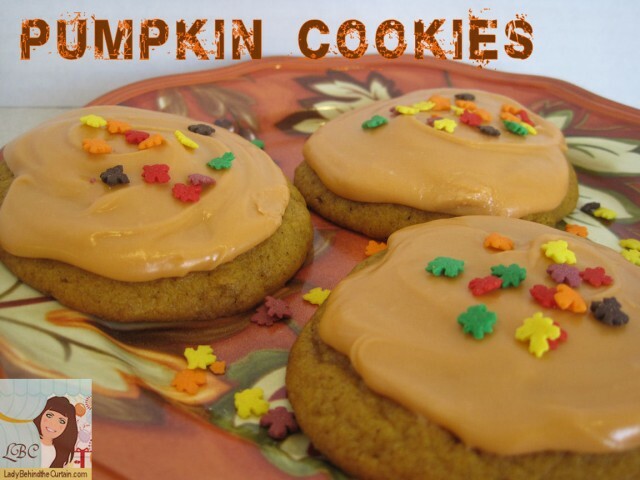 Like all pumpkin-y treats, you're going to want to let these cool before you eat them. That way, the pumpkin and spice flavors have a little time to set. Believe me, it's worth the wait. Now, let me tell you about the Nutella. 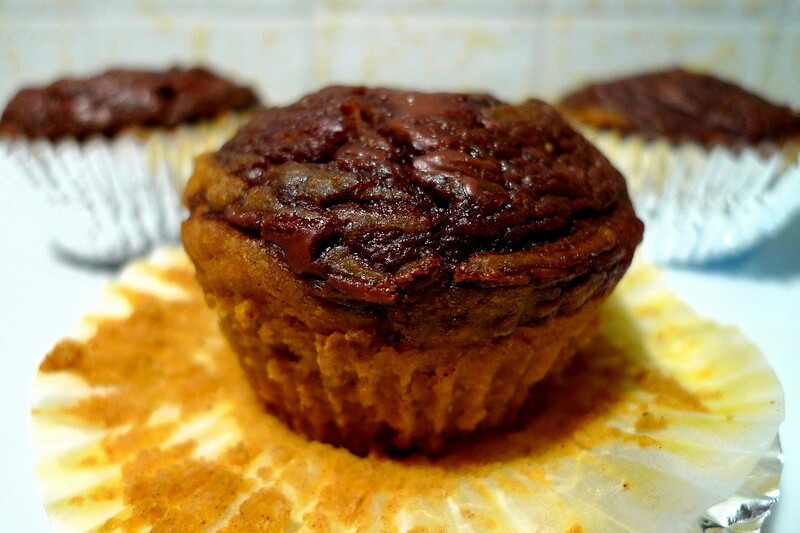 The idea of putting Nutella onto the top of the muffin is pure genius. The muffins aren't that sweet themselves. But, the Nutella adds just the right amount of sugary, chocolatey goodness that will make you feel like you're having dessert for breakfast, but still eating healthy at the same time. 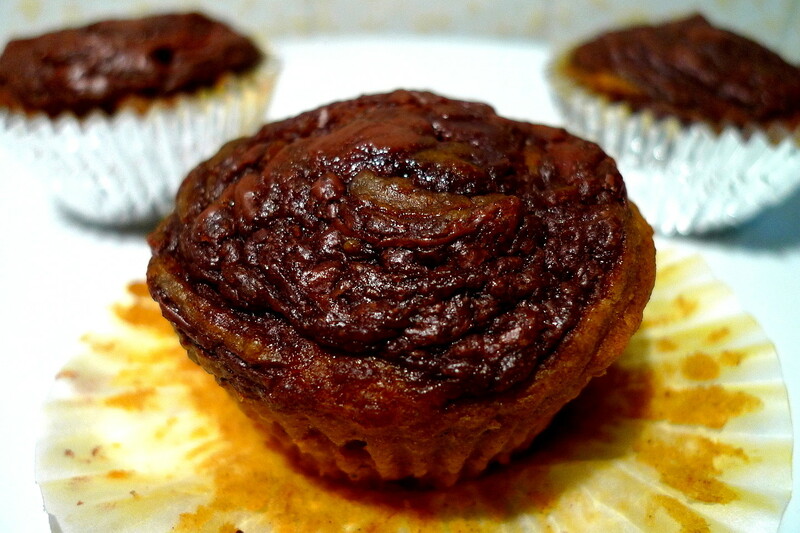 The Nutella swirled muffin tops were so good that I was sorely tempted to make off with the tops alone, you know, just like that Seinfeld episode. I can totally relate. Thanks Holly for one yummy recipe! Preheat oven to 375 degrees F. Line or spray a 12-cup muffin pan, set aside. 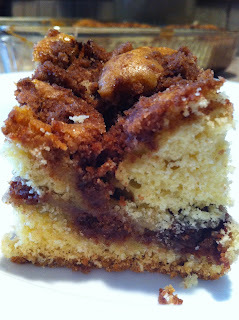 In a large bowl, whisk together the flour, cinnamon, ginger, nutmeg, sugar, baking powder, baking soda, and salt. Set aside. In a small bowl, whisk together the pumpkin puree, oil, eggs, vanilla and brown sugar. Pour the wet ingredients over the dry ingredients and whisk to combine. Scoop the batter into the prepared muffin cups evenly (will be about 3/4 full). Scoop a heaping teaspoon of Nutella onto the top of each muffin. Use a toothpick or skewer to swirl the Nutella slightly around the top of the batter. Bake the cupcakes for 25 to 30 minutes or until a skewer comes out clean. Holly added some cocoa powder to her muffins, but I opted to leave it out. These muffins tasted best after they had cooled completely. Then, you could really taste the pumpkin and spice flavors. I made half a batch and got 8 muffins.